4. Seattle SuperSonics trade Scottie Pippen to Chicago Bulls. There's something about "Polynice and Jordan" that just doesn't sound right. 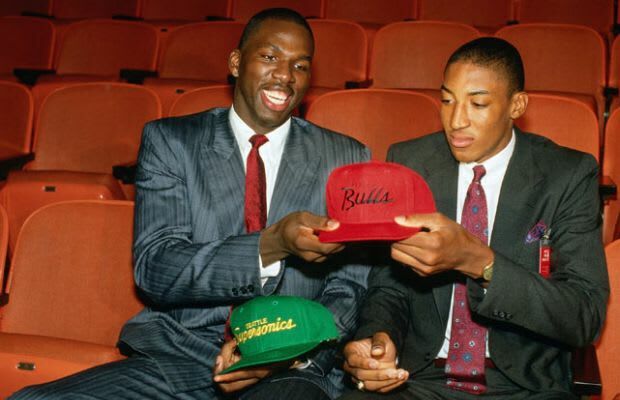 When the Seattle SuperSonics agreed to swap picks with the Chicago Bulls and given them Scottie Pippen in exchange for Olden Polynice, they had no idea what they'd be missing out on. While Polynice did enjoy a 15-year career, it's safe to say a 7.8 PPG, 6.7 RPG average is not really Hall of Fame-worthy. Seattle posted consecutive winning seasons in Polynice's first two years, but missed out on the opportunity to pair Pippen in his third season with a promising but unheralded power forward named Shawn Kemp.